Vitiligo; how much do you know? I was in the market some time ago; just purchased a chicken, while waiting for it to be cut I noticed the guys at the shop were staring at a particular direction. I followed their gaze and found out the object of attraction was a woman. At first glance she didn’t strike me as attractive (not that she was ugly) she’s advanced in age. I was wondering the reason for the continuous gaze and then it hit me; she had white patches on her face and hand. With the expression on their faces, I knew they were confused, probably didn’t know what was wrong with her. Who knows, one of them would have said leprosy if I asked. I got wind of a skin disease called VITILIGO (pronounced vi-tea-lie-go) in 2008 during a documentary that revealed the late king of pop Michael Jackson was diagnosed with it. There have been lots of misconceptions. I recently went into research after the market incident to lend my voice on the awareness. In the course of the research, I got in touch with the founder of Vitiligo Support and Awareness Foundation (VITSAF). She’ll throw more light on the subject. Ogo: My name is Ogo Maduewesi, the founder/Executive Director of Vitiligo Support and Awareness Foundation (VITSAF). A not-for-profit, patient–driven, patient-advocate organization incorporated in Nigeria and passionately concerned about the Rights and Well-being of individuals living with Vitiligo, Altered images and skin imperfections primarily in Sub-Saharan Africa, helping ameliorate the agony people suffer as a result of turning from black to white. JMAD: What gave birth to VITSAF? Ogo: My own experiences and search for answers to some questions I came across living with Vitiligo and the public’s attitude, direct and indirect discrimination I experienced in my early years of living with Vitiligo. It all started with a quest to help myself live and manage the condition. JMAD: What exactly is Vitiligo? JMAD: When did you notice you had it and how did you feel? Ogo: I noticed it Feb, 2005. It didn’t feel like anything because I didn’t know exactly what it was. I took it to be some sort of reaction. JMAD: How is it diagnosed? Ogo: It was not an easy one as I first met a Doctor who called it fungal growth and prescribed some cream which I used for about 2months with no positive results. I went to get a lab test where I was told I had some serious infection as they tried to talk me into believing that a part of my body was swollen. Then I tried the Skin clinic of General Hospital Lagos and on three occasions I was told I was late and couldn’t meet with the Dermatologist. Eventually it was diagnosed in LUTH Skin Clinic in June 2005. JMAD: What are the causes? Ogo: The precise cause of Vitiligo is not yet known. It remains unclear what causes damage to melanocytes and their subsequent total inactivation and/or disappearance in Vitiligo skin. There are several theories; the most prominent are autoimmune (self-destruction of melanocytes), Neurohumoral, related to abnormal detachment of melanocytes from the epidermal layers and auto cytotoxic. None are mutually exclusive, and it is likely that each of them partially contribute to the disease development. 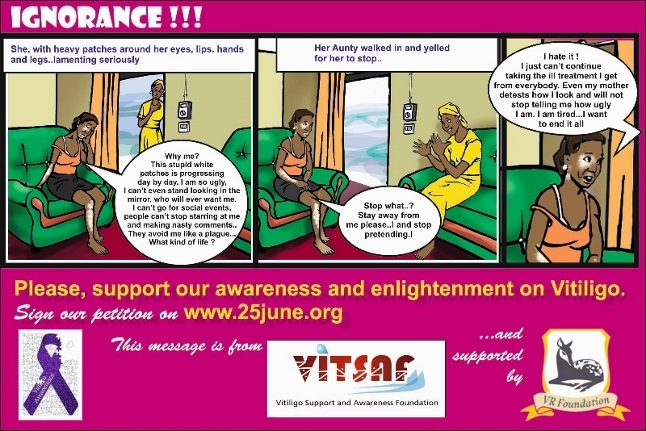 Others relate the onset of Vitiligo to emotional trauma due to accident, death, divorce etc. Ogo: No, Vitiligo is not a communicable condition however it is estimated that approximately 30% of Vitiligo patients have a family history of Vitiligo confirming it could be genetic. Ogo: No, Vitiligo is not cancerous. JMAD: Where can someone receive treatment, how is it treated and can it be cured? Ogo: One can get treatment from any of the Skin Clinics in Teaching Hospitals and from private skin clinics. Truly there is no uniform effective therapy on Vitiligo yet however there are so many treatment options out there ranging from topical and some oral agents to phototherapy to Surgery (e.g. melanocyte transplant) especially when lesions persist despite appropriate therapy. Unfortunately we do not have variety of these treatment options available in Nigeria today. At all stages of therapy, keep in mind that vitiligo can be a lifelong disease that may extensively damage one’s psychosocial sense of wellbeing. Acknowledging this hidden impact of the disease on quality of life and offering support for dealing with it will improve the physician – patient relationship greatly and promote a positive outcome. Camouflage can always provide temporary cosmetic relief, and psychotherapy should be offered to help patients deal with the psychological disease burden. JMAD: Have you or anyone you know, experienced discrimination? Ogo: Seriously and it has lingered, we are faced with direct and indirect discrimination daily. In places of work, even in the medical community and ultimately in the social circles. JMAD: What’s the difference between Vitiligo and Leprosy, and what are some of the misconceptions? Ogo: These two conditions are entirely different from each other. Leprosy is an infection caused by a bacteria in which patient develops light coloured patches with loss of sensation and loss of hair over these patches. Vitiligo on the other hand occurs because of loss of melanin pigment from the skin. JMAD: In your opinion, rate the level of awareness in the society? Ogo: I really prefer an observer to help me answer this, but can say that, there was less than 5% Vitiligo awareness in Nigeria before we started, but today I dare say its about 20-30%. JMAD: What is the June 25th day all about and how can people get involved? JMAD: Any last words to those reading? Ogo: I implore you to get enlightened, truly no knowledge is lost. Vitiligo is a condition anyone can come down with anytime. It really comes with serious psychological challenges, majority of people with Vitiligo do just exist not living, and others are confined to their homes. We do not need pity, but empathy. 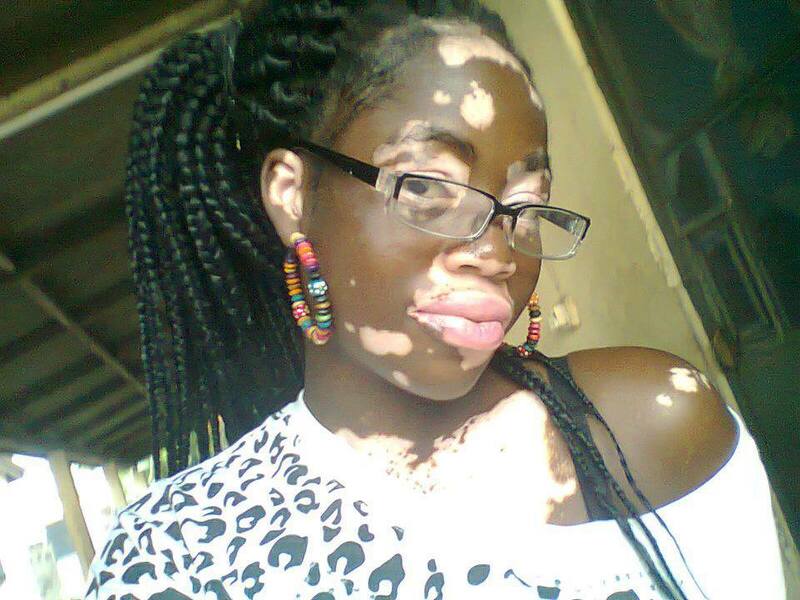 Ogo had gone through the road of Vitiligo and she’s still standing tall. Do you know of anyone going through this transition, encourage the person and let them know they are not walking alone. Author JMADPosted on September 25, 2013 September 25, 2013 Categories AwarenessTags General Hospital Lagos, June 25, Leprosy, LUTH, Melanocytes, Michael Jackson, Vitiligo, World Vitiligo Day18 Comments on Vitiligo; how much do you know? This got to me….. Today I see a gathering of people, not a church of Jesus Christ. How often have I turned a blind eye to a beggar? We’ve become so doctrinal and Jesus came for a relationship. I’m guilty too. May we practice true religion which is reaching out to. Inspiring piece. I recently got back from leave and my welcome message was a letter stating I was going to be transferred to Iran; my company is building a team to set up a branch there. You have no idea how I felt. A million and one questions ran through my mind but there were two that lingered on – family and church. I don’t have the perfect family but when all our differences are brought to the table, you’ll never have a dull moment. I’ve grown to appreciate the gift of family by having each of them in my life. Guaranteed I’m not in the same location with them but a journey of one hour by air or eight hours by road can get me to them. Iran is 3318 miles from Nigeria and will take approximately 7 hrs. by air. Church is definitely important to me and I’ve grown so used to my church, the mere thought of changing location freaks me out not to talk of a country where the Christian faith is threatened. While I was engrossed in this thought a question I had asked someone in the past popped up in my head and I’ll ask you the same question, if you are transferred to another location and there’s no church I’m not saying a branch of your local church I mean no church at all, how long will you last as a Christian? Few weeks ago Social Media was flooded with the story of a Pastor who had an affair with a lady, a whole lot was said, some became virtual soldiers for the pastor, and some took to name-calling of the lady while others pledged their support for the lady for the bold step she took. In all of this we forget it’s really not about a particular church rather the entire Christian community. We have become so religious that we are gradually losing the essence of Jesus’ death on the cross. We should have all (Christians) covered our heads with ash and put on sack-cloth to cry that such a thing was mentioned in church; do we love church more than God? I was in a leadership meeting in church, our Senior Pastor called out all the Pastors of the branches and asked anyone to indicate, if there had been any sexual relationship with any of them, while some people found it funny my heart bled. These are men and women who have been anointed to lead God’s sheep and we are having integrity issues. What spirit are they passing onto us when they stand on the pulpit to minister? I learnt something and I hope to apply it in Iran. Beyond the lifting up of hands to a good choir rendition or shouting halleluiah or amen to the pastor’s sermon; we need to know God for ourselves. When Paul and Silas were in jail they had church there, they knew God was limitless, boundless and existed everywhere at the same time. Granted the believers were praying for them but they still called out to God. A pastor in my local church said “In the Anglican church, we have the Liturgy to guide public prayer but in our closet there’s no Liturgy rather we are to pour out our lives to Him” and another pastor said “Our leadership is not to take advantage but to give advantage”. • After Sunday service is my behavior consistent throughout the week? • Can I have worship in my room when the choir isn’t singing? • Can I open my Bible on my own without a Pastor? • Can I have fellowship with God alone without a gathering? 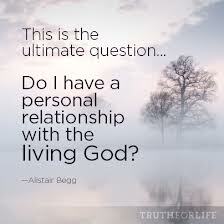 • Who does God mean to me and not just the God of my Pastor or Church but I mean a personal encounter? • If I don’t have a Christian sticker on my car, carry a family-sized Bible can anyone tell I’m a Christian? • How often have I discriminated other churches because their order of service was different from mine? Truth is we have played church for too long and it’s time to come back to our first Love Jesus Christ who first loved us in our sinful nature. Let us arise in unity and stand for the gospel of love Jesus preached. At the end of this world I’m not standing before God as a church member rather as an individual.